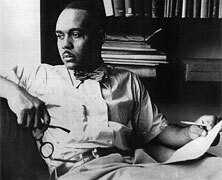 Home » Entertainment » Ralph Ellison wins National Book Award. Ralph Ellison wins National Book Award. Ralph Ellison’s powerful novel, Invisible Man, wins the National Book Award. Gospel music legend Mahalia Jackson dies this day in Evergreen Park, IL.